Super advanced soil with powerful yet gentle time release nutrients. The most advanced and complete vegetative potting soil made. The new version of The Bomb has enough nutrients to optimally support most plants through the vegetative period of growth. Fully natural and organic. No need to add any nutrients for 4 – 24 weeks of amazing growth based on plant type. 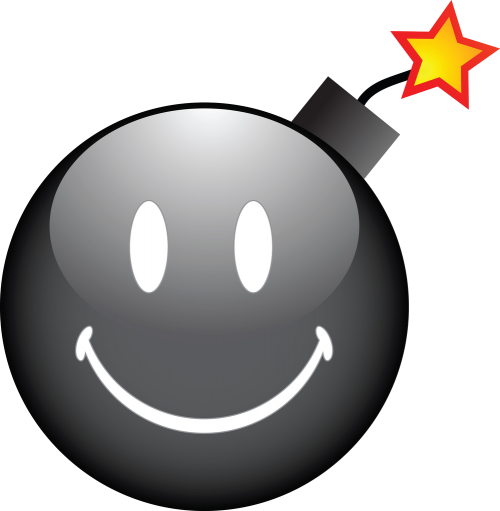 The Bomb is pH 6.5 and inoculated with billions of beneficial microorganisms. Most of our major competitors claim 27 species of microbes or less…we have over 20,000. Reach for The Bomb when you need your plants to explode! This potting mix would be considered “soilless” by some, yet it works like a superior soil and with the Dynamic Dressing compost and peat we consider it soil as well. It works very well in fabric aeration pots. The Bomb all natural potting soil will give a good 3-4 days between watering. The original mix. Coconut husk peat is the base for this mix. This version has half coco peat and half sphagnum peat. For growers who prefer all sphagnum peat. We replace the perlite with organic rice hulls. What’s in it you ask? All of this stuff. Coco peat is a proven natural alternative to mined peat moss. Using it helps slow down peat extraction from environmentally sensitive swamps worldwide. Coco coir peat will last three times as long as peat moss and sphagnum peat moss. Unlike peat moss, coco coir is hydrophilic and will re-wet easily without using wetting agents. It can hold up to 8 times its own weight in water. Used as a growing medium/potting medium, coco coir outperforms most of the popular brands of peat and sphagnum peat. Coco coir peat promotes healthy root growth in plants. This eco-friendly alternative to peat moss is derived from the husk of the coconut. Coco coir is an excellent growing medium for both commercial and home gardening applications. The hydroponics and horticulture industries have observed that plants grown with the aid of coir develop larger roots, stems and blooms. This is because unlike ordinary soil, which is usually compacted, coco peat provides more breathing space and aeration for plant roots, resulting in better growth. High nitrogen, Biodynamically prepared chicken compost, fully composted at over 140F and then cured. Non windrow turner turned and perfectly carbon to nitrogen balanced with natural sawdust for higher microbe species and more nutrients. In addition to the biodynamic preps that are inserted into the pile we inoculate with beneficial nematodes as well as the Stratiolalapse S beneficial. These great micro-arthropods will patrol your soil looking for pest insects to devoure and provide the crucial final layer of the soil food web delivering the organic nutrients to your plants. Yet one more way we build beneficial aerobic organisims. Compost tea creates its own living food web of beneficial organisims and light nutrients. These organisms crowd out and consume pathogenic organisms. They also help make nutrients more available to plants. A natural trace mineral source, AZOMITE® is unique highly mineralized ore that is a complex silica (Hydrated Sodium Calcium Aluminosilicate or HSCAS) mined in Utah from a deposit left by an ancient volcanic eruption that was ejected out of the side of a mountain. The volcanic ash filled a small nearby sea bed. The combination of seawater, fed by hundreds of rivers rich in minerals, and the rare and abundant minerals present in volcanic ash created the AZOMITE® deposit which is found nowhere else on Earth. The deposit is very old, perhaps as much as 30 million years. Today, the geologic characteristic is an outcropping known as a hogback. Harvested from an archeological excavation in the Colorado Rockies, this amazing organic material is over 45 million years old and has large amounts of humic and fulvic acid. It was the ancient plant mater surrounding actual mastodon and mammoth remains. Humic Acid makes nutrients more absorbable. Essentially highly concentrated ancient organic matter. Humic acid is a principal component of humic substances, which are the major organic constituents of soil (humus), peat, coal, many upland streams, dystrophic lakes, and ocean water. It is produced by biodegradation of dead organic matter. It is not a single acid; rather, it is a complex mixture of many different acids containing carboxyl and phenolate groups so that the mixture behaves functionally as a dibasic acid or, occasionally, as a tribasic acid. 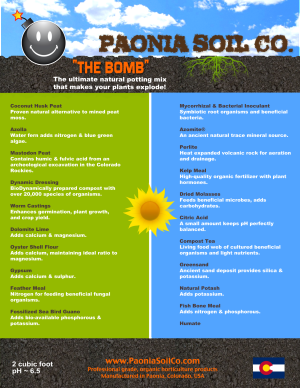 13 strains of beneficial bacteria break down nutrients and crowd out pathogens. 12 strains of symbiotic root organisms that increases uptake of nutrients and water. Heat expanded volcanic rock is the world’s premier organic aeration and drainage agent. This means that it lets water drain into the mix more quickly and then pulls air in as it drains out. See more about the advantages of perlite here. It is not Styrofoam as some people assume. It is rock. Kelp meal is a very high quality organic fertilizer. With an N-P-K ratio of approximately 1-0-2, it is a good source of nitrogen and potassium. It also contains minerals, amino acids, and trace amounts of other micronutrients. Kelp meal is seaweed, specifically Ascophyllus nodosum, and is harvested from the ocean. We primarily add it for it’s root stimulant and as a tonic for transplant shock. Adds calcium & magnesium. Dolomite is ground natural limestone and will buffer acidic conditions yet never raise above 7. Adds calcium and sulpher, both critical, increasing the calcium to magnesium ratio while dropping p.H. Gypsum’s bound sulpher is much less fungicidal than other sulphurs, helping microbes, yet still pushing against the dolomite to drop us closer to our 6.5 optimal p.H. A small amount is our final effort to correct the typically Alkaline water and soil conditions in Colorado. Feeds beneficial bacterial microbes and adds carbohydrates to enhance the flavor of fruits and vegetables. Ancient sand deposit provides silica & potassium. High nitrogen protein and excellent fungal organism food. Feathermeal has a good mix of soluble and non-available nitrogen to provide a great start and a long time release that you can still feed lightly on top of, if desired. High in nitrogen,protein and phosphorous another excellent beneficial microbe food. An ancient and naturally chelated source of phosphorous. Our two source method insures that plants, and especially flowering plants have what they need. An excellent natural source of potassium that is slightly more available than the green sand in the soil food web for immediate delivery.